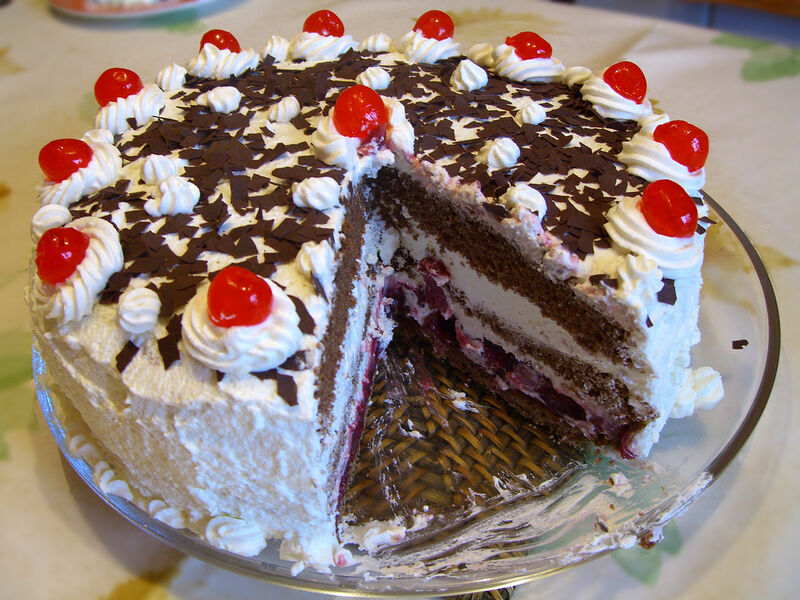 Black forest cake typically consists of several layers of chocolate cake with whipped cream with cherries between the layers. The cake is covered entirely in whipped cream and is often decorated with chocolate shavings and maraschino cherries. Bake this yummy black forest cake easily at home and surprise your loved ones! Preheat the oven to 180 degree C and grease a cake pan or baking tin; lightly dust it with all purpose flour, keep aside. Sift flour, baking powder, baking soda and cocoa in a big bowl. Beat sugar and eggs nicely in a separate bowl until the sugar dissolves completely. Stir together oil and milk and then add the egg-sugar mixture into it gradually, mix well. Pour the wet ingredients mixture into dry ingredients bowl and mix altogether well until smooth. Pour the batter into greased cake pan or baking tin and bake for 35-40 minutes or until a toothpick inserted in the center comes out clean. Bring out of the oven and let it cool down for 15 minutes. Then unmold the cake and let it cool completely. Mix icing sugar, vanilla and whipped cream in a bowl and beat until smooth; keep aside. Cut the cake horizontally in three layers. Apply cherry syrup or sugar syrup on one surface of the cut sides. Apply a layer of whipped cream mixture on top of one of the two layers. Stack another layer on top and repeat with the other layer. Place the third layer on top and cover the cake from all sides and top with the whipped cream mixture evenly. Garnish with chocolate shavings and maraschino cherries. Refrigerate the cake for at least an hour and then serve.